In 1986, the New York-based street artist Keith Haring opened his Pop Shop, making his art accessible to both collectors and children from the Bronx. “My work was starting to become more expensive and more popular within the art market… [this] meant that only people who could afford big art prices had access to the work,” he said. Now, Lévy Gorvy gallery has recreated part of the artist’s Pop Shop, complete with original wallpaper, at Art Basel in Miami Beach (ABMB). The highlight is Haring’s hot-pink Silence = Death, painted in 1988, the year he was diagnosed with Aids. As we went to press, the work was on reserve for a European private collector for around $8.5m—a record for the artist. 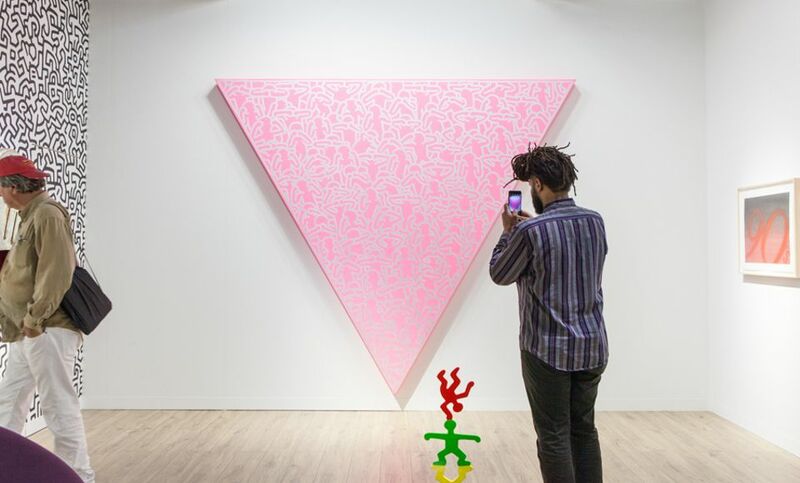 The gallery’s co-owner Brett Gorvy considers Haring to be wildly undervalued compared with some of his peers, such as Jean-Michel Basquiat. “Part of the problem is understanding the work: what is an edition, what is an original,” he says. Gladstone Gallery, which represents the Keith Haring Foundation, sold out its Haring mini-show at the fair’s VIP opening. Priced between $300,000 and $1m, the seven rarely seen pieces, dating from 1981 to 1990, include painted Japanese screens, a glass window and a terracotta vase. Several street artists equally at home in a white cube are also at the fair, including OSGEMEOS at Lehmann Maupin, Madsaki at Perrotin and KAWS at Pace Prints. At Frieze London in October, Lehmann Maupin dedicated its stand to new, large-scale paintings and sculptures by OSGEMEOS ($130,000-$200,000); all sold to collectors from Austria, Japan, Miami and New York. At ABMB, a small untitled 2013 painting by the Brazilian twins sold for around $65,000. Banksy’s work is a regular fixture during Miami Art Week. This year, the UK street artist is the subject of two “unauthorised” exhibitions: The Art of Banksy (Magic City Studios, until 28 February 2019), organised by his former agent Steve Lazarides and featuring more than 80 indoor pieces, and Saving Banksy Miami (Superchief Gallery, until 9 December), which centres on a giant rat he stencilled on a house in San Francisco in 2010. Until recently, his works were relatively inexpensive (less than £1m for a painting), but his shredding stunt at Sotheby’s in October, ostensibly intended to unsettle the market, has in some instances doubled his prices.